"By far and away one of the best experiences getting a prescription for my contacts." I have been to 4 other eye care centers and in my mind McDonald Eye Care is the best! "My entire family of 5 uses McDonald Eye Care Assoc. Always fantastic customer service." 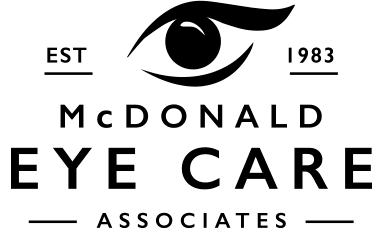 McDonald Eye Care Associates has over 30 years of experience of quality eye care in the Lakeville, Minnesota, area. As a multigenerational family practice, McDonald Eye Care Associates is especially family oriented. Patients of all ages get the eye care they need in a welcoming and family-friendly environment. The McDonald Eye Care Associates team is proud to offer the best technology available in the optical world today. They're sometimes called "The Mayo of Eye Care" because they can help with all issues under one roof. Some of the many services offered include eye exams, primary eye care, pediatric eye care, cataract and LASIK co-management, emergency eye care, contacts, glasses and sunglasses, vision therapy, and sports vision care. The team also offers concussion management. While McDonald Eye Care Associates can help with most vision care needs, the team can refer you to an experienced specialist if necessary. McDonald Eye Care Associates believes in supportive eye care that focuses on continuity of care. Patients get not only treatment for individual problems, but also the support they need for good vision for the long term. In addition to helping patients enjoy good vision health and wellness, McDonald Eye Care Associates believes in giving back to the community through work with schools, the Rotary Club, and the local chamber of commerce. Everyone wants personalized and supportive care from an experienced eye doctor. The team at McDonald Eye Care Associates provides exactly that while using the latest and most effective optometric technology and procedures. Schedule through online booking now or call the office for an appointment anytime. Vision training could be the secret weapon you’re looking for to help keep you safe while your head’s in the game and take your game to the next level. As part of a sports management program, vision training can elevate your play. Today more than ever the increased use of technology poses an eye strain risk that previous generations didn’t face. March is Workplace Eye Wellness Month, a good time to learn the importance of protecting your vision on the job. Whether you’re an advanced athlete or an amateur, you can benefit from improving peripheral vision — no matter what sport you play. Our vision therapy can improve your peripheral vision and reduce your risk of being injured. "I am so grateful for all the help I got with my special needs child today at McDonald Eye Care Associates. Professional, friendly, amazing establishment." "This is the only eye doctor I will go to. I’ve been going for over 20 years. I’m always treated with respect and given the best service with the best eye care." "I would recommend Eye Care Associates for anyone who wants the best care no matter the circumstances." "I had to visit McDonald Eye Care due to a minor injury to one of my eyes. I would highly recommend them for eye care needs. They are a 10." "My personal experience with Mcdonald Eye Care has been experienced, professional, friendly, family oriented care. I would recommend this clinic to anyone."